It appears that one player will take control of the guards, whereas the remaining players play as ninja and attempt to complete a set of missions using a variety of ninja weaponry such as shuriken and poisoned rice. 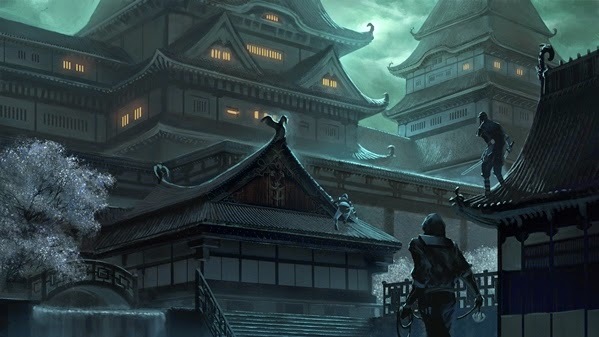 The guard player’s aim is to keep the ninja at bay until sun rise and then he can unleash an entire guard house upon them. I must admit that at the moment this game sounds very similar to AEG’s Legend of the Scorpion Clan. Both games involve ninja’s sneaking into fortified houses, both games end at sunrise and both involve deploying an array of ninja weaponry. Where Rise of Kage has a slight advantage at the moment is the hint of varying missions, maybe we’ll see a Space Hulk style modular board? For more information keep an eye on the Rise of the Kage Facebook page.